Welcome to the Swiss HLG Winter Conference. We are excited to welcome you to our Winter Conference 2018! We are thrilled to announce that we have more than 100 Business Development professionals attending our Winter Conference this year. The next few days are the perfect opportunity to meet and build personal relationships with leading executives not only the from the healthcare industry, but our growing network from MedTech, Generics, Biosimilars, Investment & Finances, Biotech & Startup, Health Food Industry, Cosmetics and Legal & IP industries. Swiss HLG and BaselArea are excited to invite you to the Swiss HLG’s 4th start-up workshop collaboration. The risk-adjusted, net present value (rNPV) method is the standard valuation method used within pharma and biotech companies when valuing assets beyond discovery stage. This approach depicts the drug/pipeline development plan using R&D costs & timeline, success rates, and peak sales potential. The quantity of available information in the pharmaceutical area enables to determine and benchmark those assumptions. Well-calibrated the rNPV method is thus a powerful tool to build, challenge and value the company’s strategy. It also shows how the value of the company develops along reaching milestones. Is it however enough for investors? From an investor’s perspective, it is crucial to understand how long it takes before an exit and what is the potential for ROI (Return on Investment). They need to figure out the conditions to harvest their investment as well as to anticipate the multiple later-round investors and incentive packages to key employees that may dilute their stake. While rNPV highlights the roadmap for the scientific bet of the company, the VC method highlights the one for the cash to be invested in. The purpose of this workshop is to decrypt the reasons behind using rNPV or VC methodologies to value a Biotech company. With the support of interactive cases, the participants will learn more about how Biotech companies can better anticipate the VCs’ point of view when presenting their valuation work. To register, email: stephan.emmerth@baselarea.swiss , please mention when registering that you are a Swiss HLG member. 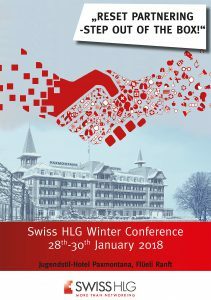 Join us at the Swiss HLG Winter Conference 2018! Swiss HLG would like to wish you all a very Happy New Year and we hope you enjoyed the festive season. At Swiss HLG, the celebrations are not over. Start 2018 off with a bang and join us at our Winter Conference 2018! Just a little more than 2 weeks to go, hurry and register for our business development and networking event. We have an impressive panel of speakers from, AZ, Actelion, Novartis, Debiopharm, Santen, Sanofi.You can look forward to engaging with an equally interesting and diverse group of senior BD&L attendees. Join us meet your peers in Roche, Novartis, Recordati, Santhera, Shire, Servier, Ferring and many more. How other industries, such as luxury or consumer goods, rely strongly on partnerships? Are there new tricks to be learned from other industries, adjacent or completely separate from Life sciences? How do Licensing, Business Development Partnering leaders peruse the right deal? How to establish partnerships that go beyond the molecule? For more details: http://swisshlg-conference.com/ or go ahead and Register here.